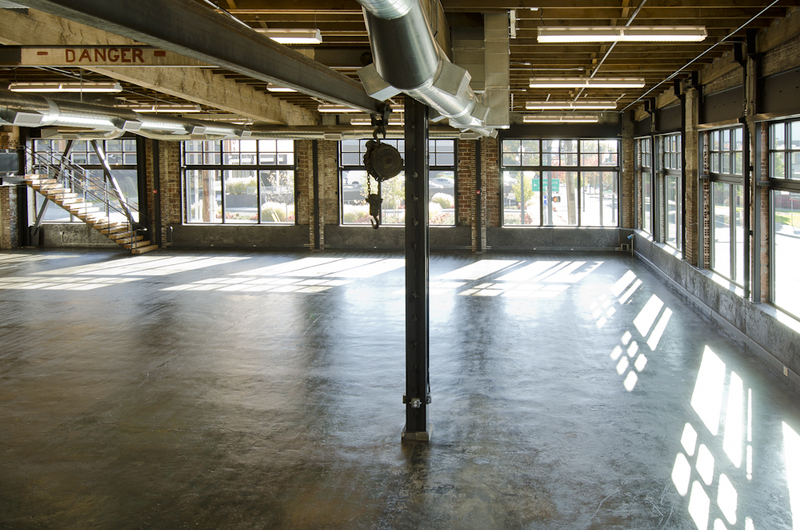 The annex totals over 14,000 SF of usable space on two floors. The greatroom with its soaring, beamed ceilings, large windows, and city views, is an industrial reflection of classic ballroom grandeur. The mezzanine, a lounge area perched above the greatroom, works well for receptions, more intimate gatherings, or for smaller groupings within an event. 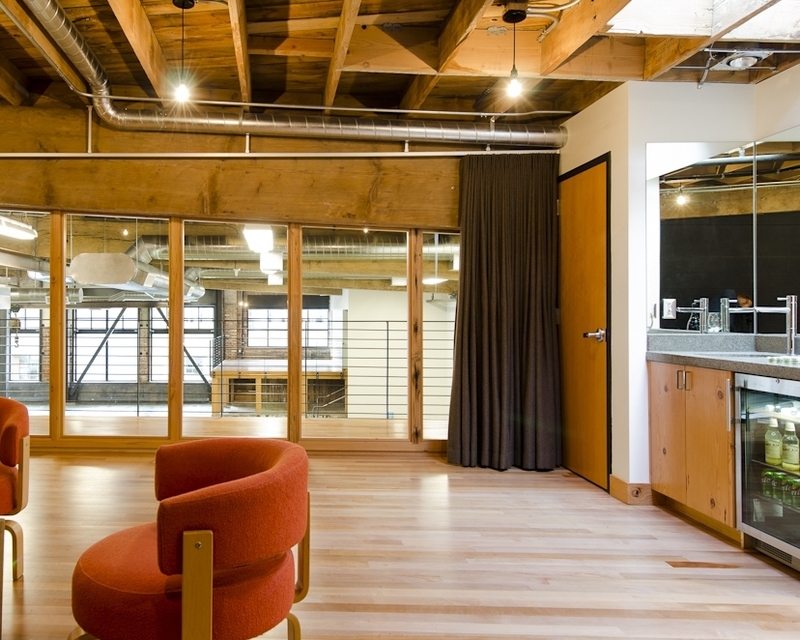 The clubroom, a converted machine shop, is an intriguing and intimate space, with architectural columns, cool urban views, and divisible space. Together they offer a versatile and flexible solution for the event planner. Fire Marshall approved capacity is below. Please be aware that capacity goes down as furniture, staging, etc. goes in. The greatroom is a vast, open, and programmable space. Though at first glance it looks like an industrial warehouse, it was carefully designed for event production and ease of execution. Caterers, event planners, sound engineers, and a bevy of event professionals were consulted in its initial design. The result is a very simple space layout with easy access, expansive whitewalls for projection, a robust electrical infrastructure, quality A/V, and programmable lighting. The nest, an elevated area over the loading dock, is an ideal place for DJs or VIPs. The mezzanine, a lounge area perched above the greatroom, works well for receptions, more intimate gatherings, or for smaller groupings within an event. Just off the mezzanine lies the greenroom, a large room with a private bathroom, shower, deck, courtesy bar, TV, and glass wall overlooking the greatroom. It’s the perfect spot for brides and bands to relax and prepare before the big show. The clubroom acts as a complement to the greatroom – adding easily divisible space to the greatroom’s more open warehouse format. Large glass doors partition the clubroom into three distinct areas. By itself, the clubroom works well for events that want to be larger in number, yet still maintain a certain intimacy. 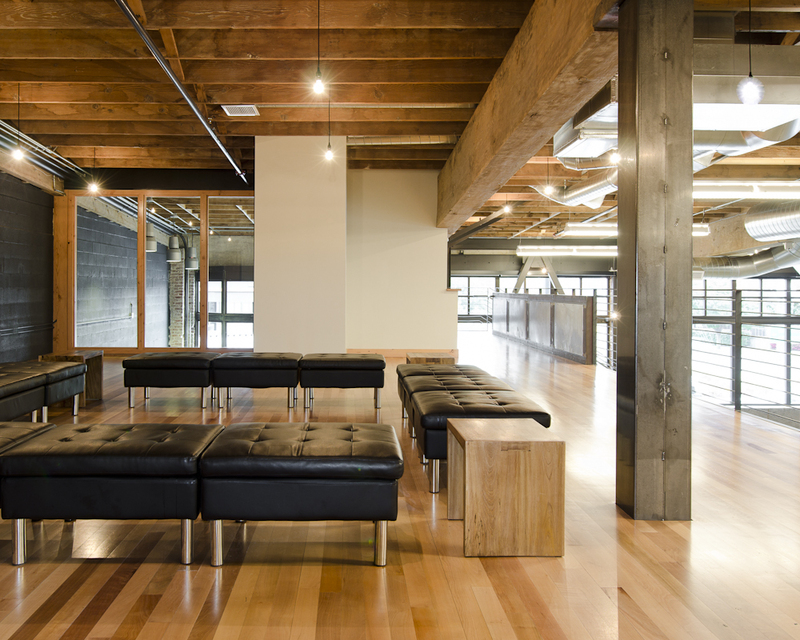 Robust columns with oversized capitals ground the space, while the wood-casted concrete ceilings offer a more subtle texture overhead. Along exterior walls, between the columns and under the clearstory mullions, a line of built-in benches leaves a rich repeating backdrop. The infrastructure, while similar to the greatroom, also includes Lightolier lighting tracks for more specialized lighting solutions. White walls: Multiple, large, white surfaces for projection. A/V: Exceptional, quality A/V system engineered for the space. Lighting system: Versatile, sophisticated lighting with dimming and multiple scenes. Access: Direct vehicle access to both levels. Wi-Fi: 100 casual device connectivity included. Rigging: Abundant rigging/mounting points for trusses and other apparatus. ADA lift: Easy access to clubroom and greatroom. Mobile bars: 14 steel-framed, industrial bars. Electrical: Robust infrastructure with numerous options. greenroom: Private bathroom, shower, closet, full-length mirror, and sitting area.